The Mazhaga Stone is the traditional yemenite tool used for grinding herbs. Dating back to neolithic time grinding stones have stood at the heart of early civilaztions food processing methods. In Old-time Yemen the Mazhaga was used to produce Zhug, hence its name. 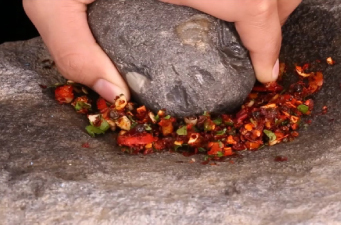 Cilantro, parsley, chilli peppers and garlic would be ground down on the Mazhaga stone to create the now famous spicy paste. The process would leave behind a tell-tale dark “wet” spot on the volcanic rock. Over time the juices would permeate the upper layers of the rock and the dark spot would become permanent. The Mazhaga begat the Zhug and the connection between ancient and new would be sealed.